Watchable sword and sandal fantasy epic enlivened by director Tarsem Singh's typically stunning production design and some enjoyable action scenes; however, the plot is frequently silly, there's some ropey acting and the film has also been the victim of some painfully obvious cutting to reduce its gore content. 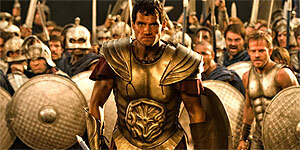 Directed by Tarsem Singh (more usually just known as Tarsem), Immortals is set in ancient Greece and stars Henry Cavill (soon to be the new Superman) as Theseus, a stonemason who is unwittingly being groomed for heroism by the god Zeus (Luke Evans in god form, John Hurt in old man disguise form). When the vicious King Hyperion (Mickey Rourke) slaughters his mother, Theseus vows revenge and sets off to find the all-powerful Epirus Bow before Hyperion can get his hands on it and use it to release the imprisoned Titans (don't ask) and destroy the gods. Along the way, Theseus teams up with virginal Sybilline Oracle Phaedra (Freida Pinto) and scrappy slave Stavros (Stephen Dorff), while receiving the occasional unseen helping hand from the likes of Poseidon (Twilight's Kellan Lutz), despite the fact that the gods are forbidden to intervene. Essentially, Immortals plays like 300 meets Clash of the Titans, only with the happy addition of Tarsem's extraordinary eye for production design. Needless to say, the sets and costumes are genuinely stunning and there are some memorably striking images, particularly the opening shot of the caged and blackened Titans with a pole in their mouths. Cavill makes a solidly impressive lead (which bodes well for Man of Steel) and there's strong support from Hurt and Dorff, while Rourke is clearly having a whale of a time as Hyperion, who likes to end every encounter by murdering someone or, at the very least, taking an enormous hammer to their testicles. Similarly, the fight scenes are well handled and enjoyable to watch and the 3D effects are competent, while not really adding much. Pinto is typically blank-faced and wooden as Phaedra and she has zero chemistry with Cavill. In addition, the plot is both under-written (it's never clear why Hyperion wants to destroy the world, for example) and inconsistent (Zeus, for one thing, is something of a hypocrite) and the dialogue is frequently flat. However, the film's biggest problem is that it's been the victim of some painfully obvious cuts by the BBFC in order to get a 15 rating, which lessens the dramatic impact of three key scenes and significantly reduces the intended gore factor. In short, Immortals is far from perfect but it's gorgeous to look at and it does at least deliver some trashy sword-and-sandal-based thrills.